It's always fun to read the articles from back then. I'm not sure that it qualifies as a road test though.... did the author even discuss how it rode? 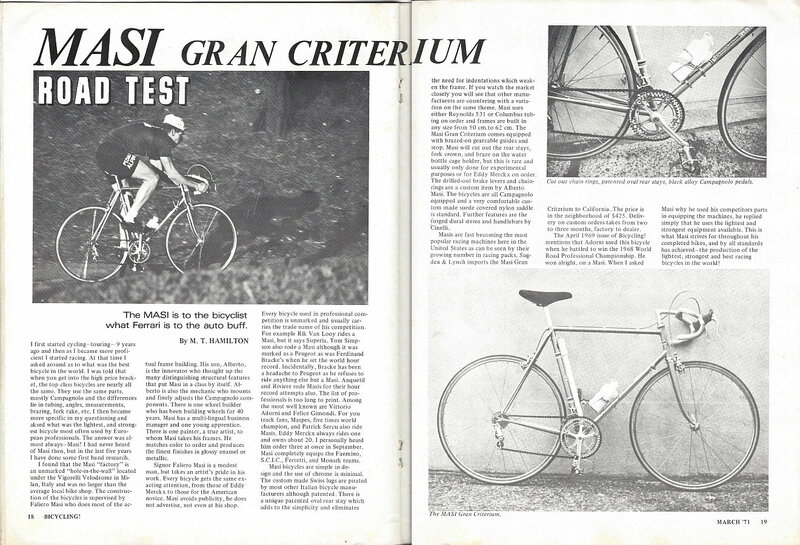 It was a nice review of the Masi history. I was surprised to see that they used both Reynolds and Columbus tubing; I would have thought that they might be loyal to Columbus. Yeah, I've been a bit disappointed too. Bicycling! appears to be still getting its legs as a publication and doing their best to stretch their budget in 1971. I think they are still using "off the street" experienced riders for writing these road tests in 1971, but it's difficult to believe this is what the experienced rider would want to read, even in 1971. Also, there doesn't seem to be an established format yet for reporting these road tests. But I'm just a math and science guy, so what do I know about marketing or the publication business? Anyway, it's bound to get better in the years ahead. We have quite a few until we run out of C & V timeline space. Another awesome blast from the past! As a long time Masi owner, I enjoyed this. Interesting perspective since this was written just before the big sellout and move to California. Undoubtedly I'm in the minority on this, but I feel that road test type ride reviews discussing the subjective feel of a bike are often kind of dumb. Much of what gets discussed in that sort of review has more to do with the tires, wheels, set up and sizing than the frame itself. OTOH, the article does claim to be a "road test", and it's true that there really isn't much of one. FWIW Masis were always noted for being responsive and intuitive handling, but not twitchy. I suspect they were already using 73.5º parallel geometry and neutral trail that was standard in California Masis. To me, what makes/made Masi special was that patented ovalized chaintay with no indents. That they did mention. It seems like no big deal now, but it think it really did stiffen up the BB area, and made them very responsive despite being quite light. FWIW Masi always used 531 preferentially. Columbus was a custom spec. I tend to agree. How many times have we read a road test where the author waxes on about how the bike disappears beneath him, it responds to his every pedal stroke, anticipates his urge to turn, etc. Or, as the cliche goes, "it's laterally stiff but vertically compliant". Granted, if I was stuck with having to come up with a novel and creative way to describe the ride of every bike rolling out of the factories, I'd probably burn out and fall back on the standard descriptions too. 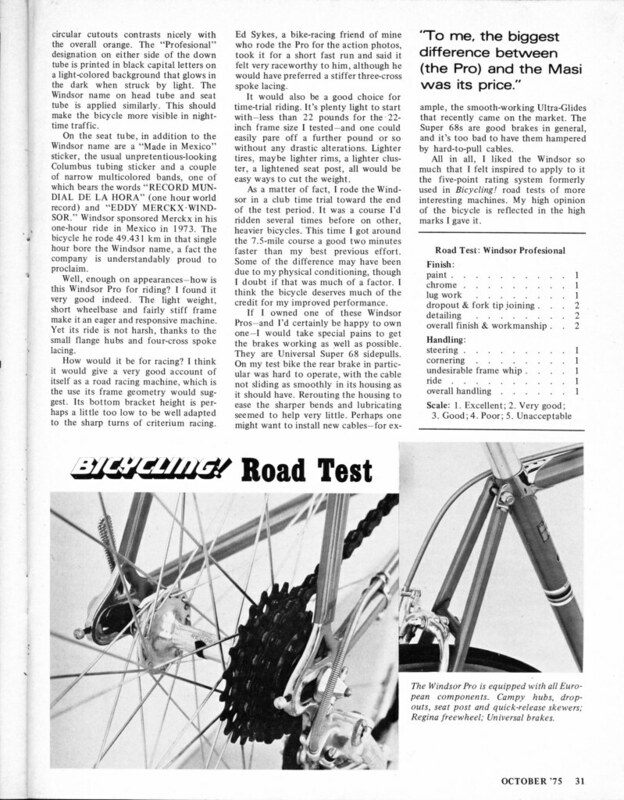 For what it's worth, one of the earliest copies of Bicycling that I managed to keep is the October 1975 issue. 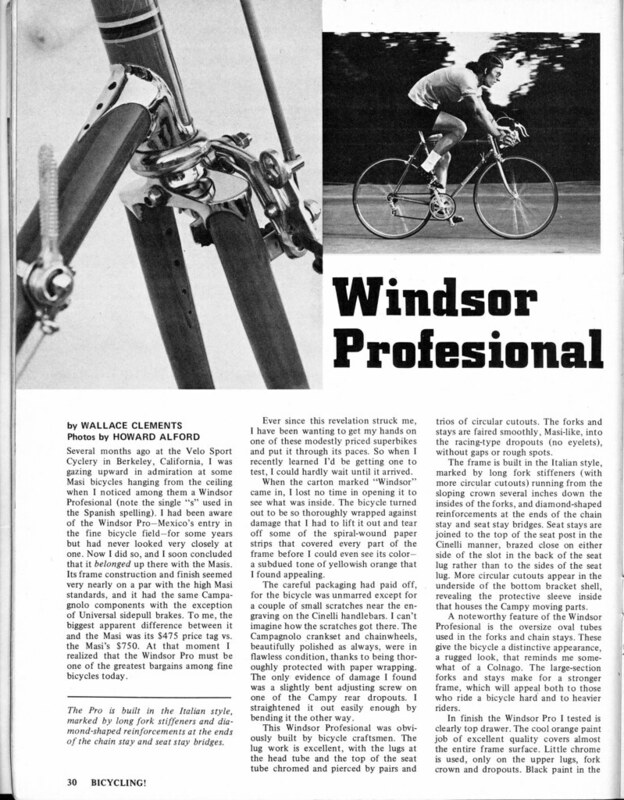 It has an article on the Windsor Pro. While it doesn't call it a road test/review, it does contain the following text: "The light weight, short wheelbase and fairly stiff frame make it an eager and responsive machine. Yet its ride is not harsh, thanks to the small flange hubs and four-cross spoke lacing." In defense of the author, he does use the bike in a time trial and goes into further detail of the bike's ride. I'll attach the article below. In 1971, it was probably for some bikes the luck of finding one to photograph and a willing owner to share. Love the misinformation… the Bottom bracket shell is Swiss, but available to others as the same, (Cinelli) or with slight variations, chainstay spigot points either oriented top to bottom or side to side. The lugs are formed steel by DuBois, ref 32. Yes, Masi used Reynolds and or Columbus. (when they arrived at Carlsbad, the production frames got Reynolds, the Columbus was extra ($25) and special order initially. 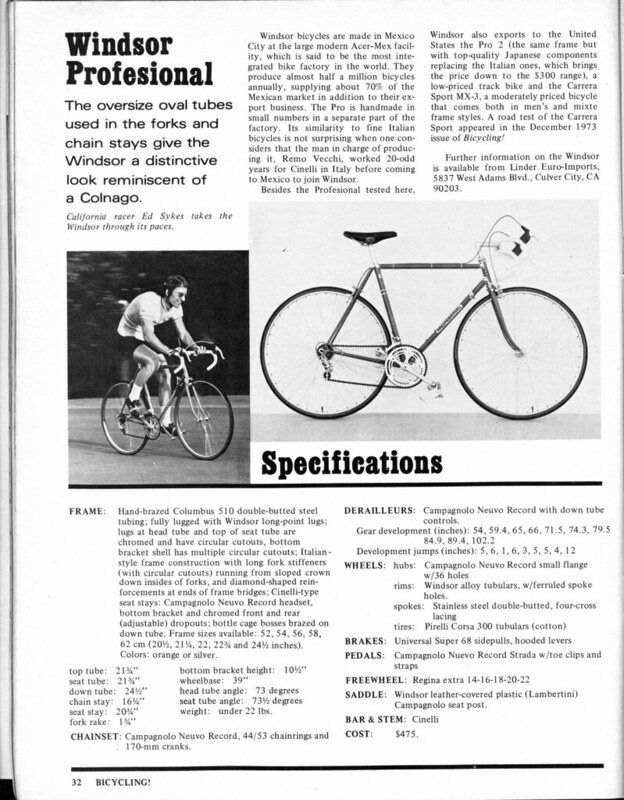 The word at the race starting line in the 70's was the Columbus was better due to the beefier fork sections.